On 16 December 2015, we launched our first good practice toolkit, Libraries Shaping the Future. Today, I’m pleased to confirm we have launched our second on Community Libraries. 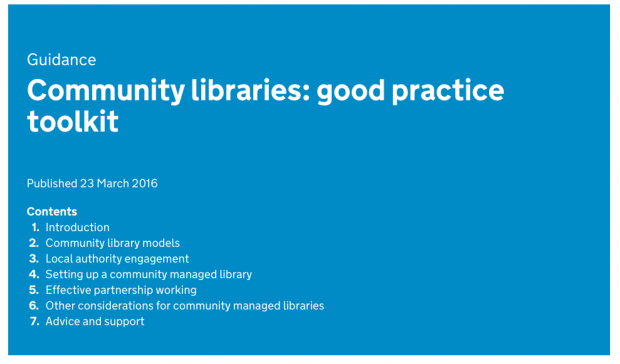 In her blog of 25 January, Sharon Kirkpatrick, one of our secondees, talked about the development of a Community Libraries: Good Practice Toolkit to meet the need identified in the Independent Library Report for England. The Report recommended sharing information, lessons learnt and good practice between Head of Library Services working with volunteers and community-led libraries, and for community organisations who are thinking of taking on the management of a community library. The new Toolkit follows the process from community engagement through to setting up a community managed library from a local authority and community perspective. It includes regulatory and operational issues that need to be considered and also looks at volunteering schemes in local authority libraries. This Toolkit is a 'beta' version which means that it is still in development - a few people have reviewed it and provided feedback, but now we want to open it up to a wider group of users to gather their views. During this beta phase, we will be continually testing and improving the Toolkit and ensuring that the information is current. And finally, as ever, my thanks go to Sharon (who led the project and wrote much of the content), Charlotte Lane and Julia Chandler (who turned it into the web document you see today), and particularly to all the many library staff and communities who generously provided their time and knowledge to make this happen.